"YOU PIC THE PRODUCTS!!! YOU PIC THE PRICE!!! 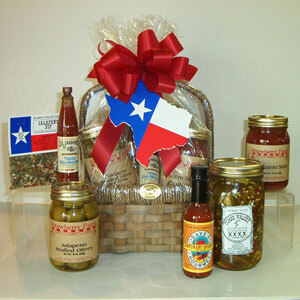 This gift box offers plenty of fiery sauces, salsas and jalapenos to titillate the taste buds. Dumas Walker Mexican Strawberries - Sweet Fire Jalapenos, Jalapeno Stuffed Olives, Habanero Salsa and Jalapeno Dip Mix for the truly courageous. We provide you with plenty of options for items to add to your Gift Box or Gift Basket. You pic the items and even a card. We will handle the rest. We cannot make giving a great gift any easier than this!" Shipping costs are added to the total price once the weight and destination of the package is determined. Actual costs may very depending on destination and size. Packages with shipping costs under $20 are added to the total cost and shipped right away. If total shipping costs exceed $20, we will contact you for permission to ship. If you would like to know the exact cost of shipping prior to purchase, or if you are looking for special rates for volume purchases, just give us a call at 800-270-7984 and one of our staff will be happy to help you.